On this occasion, we will give you some tips that might be helpful for those looking for ideas for remodeling your kitchen but with a cheap cost. We also give you some tips how to remodeling, renovate and maximizes the function of your kitchen although you have small kitchen .The article Tips of Kitchen Remodeling Ideas On A Budget, very appropriate for you that have limited budget and space to remodeling your kitchen. Should we do that is we have to know the best kitchen corners, so it can adjust the layout of your kitchen with the right equipment. Use of kitchen appliances that fit the needs, should not be a luxury. So you can trim the budget for remodeling or renovate your kitchen. And most importantly we must make the kitchen as comfortable as possible, minimalist but still good. If you want a hardwood kitchen floor or is ceramic tile. You can looking for discontinued ceramic tile to completely outfit your kitchen floor, and match your kitchen counters while holding your cost to a minimum. Or you can choose some really good discounted hardwood flooring that will provide a rich backdrop for your kitchen cabinets. You can do multiple ways e.g. with Installing self-adhesive floor tile, different styles and patterns with right way. Or you can find vinyl flooring that looks just like tile or hardwood. When you see countertops, granite and Corian they look expensive. But by installing inexpensive tile, you can save 30% or more, and be able to choose a cheap tile backsplash that matches your floor and cabinets. If you are planning to have kitchen with ceramic tile for a countertop, you can pick some beautiful kitchen tile backsplash designs. This alone can really set your kitchen apart, making a huge difference in the look for the little extra you spend. If you look for special deals, you can find discount glass tile that will make your kitchen the talk of the neighborhood. 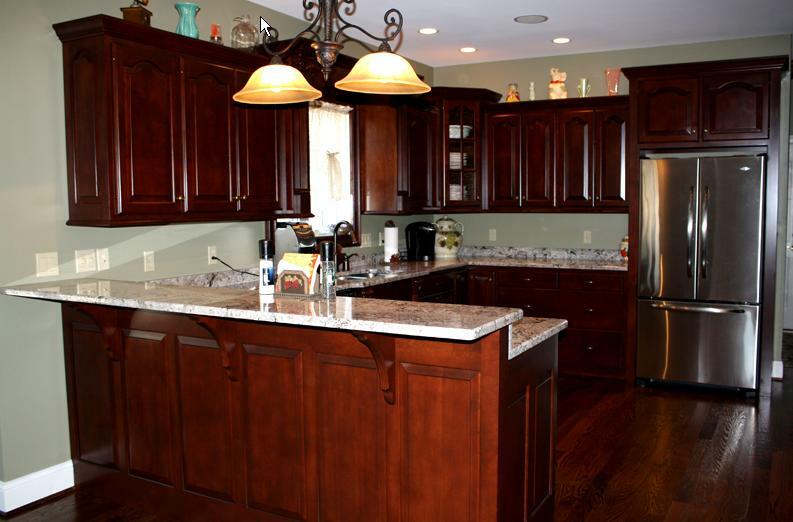 If you want to remodel your Kitchen Cabinets, we will give you good tips. You can find some tall kitchen pantry cabinets. This provides you with additional food storage for the closet. A matching stained pantry door with a stained glass insert can really accent your kitchen area. When we are remodeling kitchen, it makes sense to replace the sink with a modern looking one. This is one of the cheapest items you will need to buy. If you are changing appliance panels to give a different look and color, you may want to match your sink to the appliances. You can purchase dishwasher panels for most new style dishwashers. If you decide to have stainless steel appliances, you can install a stainless steel sink to match them. For a woman or moms, the kitchen has become one of the most important place to conduct their activities. So they definitely wanted the best kitchen. A modern looking and cozy kitchen will help you feel better about it, but also increase the resale value of your home. There are a few tips to consider prior to renovating or remodeling your kitchen. The size of the kitchen is one of the most important aspects that will determine what you can, and should do. Kitchen with small space maybe makes you less productive within working. But even a smaller kitchen can be arranged in such a way, and decorated, to make it look larger, and be more functional. For example, going with lighter colors can make a room look larger while dark colors can give the appearance of a smaller room. Related Post "Tips of Kitchen Remodeling Ideas On A Budget"